Mahjongg blog: Where's My Card? If you are a mahjongg player, you know the 2019 card has been released by the National Mah Jongg League. The League sends over 300,000 cards to the membership beginning in the first week of March. A second shipment goes out the first week in April, and third shipment is released the second week in April. After all the members get their cards, a shipment is made to retailers; Amazon, Hallmark stores and the like. As stated in a previous post - if you ordered your card in January or the first two weeks of February your card was mailed out the last week in March. If you ordered after that, your card will be mailed out in a later shipment. This is the time of year the League is inundated with phone calls from members who have not yet received their card. The phone is ringing off the hook and even with extra help on the phones, it may take a while before you get through. Before you call, however, there are other ways to find out where your card is. If your payment was received by the League, you would have an e-mail confirmation with a ship date. Remember, the later you pay, the later it is shipped. The second shipment has just been released, which would include cards purchased from mid-February to mid-March. If your payment was received by the League, you would have a canceled check or credit card receipt. If you do not have either, it is possible your payment was not received. If you gave your payment to a person who sent in for a group, check with that person and see if everyone has received their cards. If you are the only one who hasn't, have the person call the League. Have you had an address change since you purchased your card? Check to see if your mail has been forwarded. Are you certain that you ordered from www.nationalmahjonggleague.org? Check your credit card receipt to see who the charge is from. The League does not charge tax or shipping for card orders. 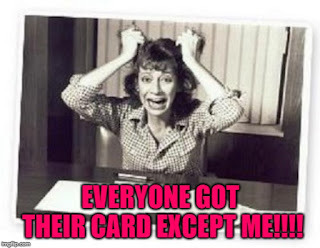 Remember, online retailers will not get their cards until the member orders are caught up. If you pre-ordered from an online store, they will send the cards to their customers after they receive them from the League. Retail stores will get them at the same time as the online sites. Cards are sent by U.S. mail and delivery times can vary. A card can be delivered any time up to two weeks after shipment, even in places close to the League office. It is not unusual for one person to receive a card but not her neighbor. Before you call the League in a panic, make sure your order was received, and that you have given sufficient time to pass from your ship date. The League will take your call Monday - Friday 9 a.m. to 5 p.m. Eastern Daylight Time. The office is closed from 12:30-1 pm for lunch. Everyone is anxious for their card to come - and for good reason! Yours will be in hand before you know it! I ordered on Jan 19th from them directly on line. I have confirmation email, my credit card was charged and I never received them. What makes it more aggravating is they never answer their phones. It rings and then goes busy. The mavens can answer questions about rules, but a business office should be answering calls about shipments. The phones could be swamped and difficult to get through. Please keep trying. I hope your situation was resolved. I am trying to update my email address on my member site. It is not clear on the site how to that.